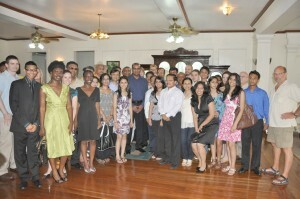 The Guyana Watch Medical Team meets President Jagdeo at State House last evening. The Guyana Watch Medical team wrapped up its last clinic yesterday at the Windsor Forest Primary School. The team saw more than 3000 patients in less than a week. The visiting medical team has 13 doctors, two pharmacists, two dentists and 16 support staffers. They needed every one of them yesterday as they examined more than 500 people, prescribing treatments and dispensing medication. Even though the team has been in the field for one week, the members were no less energetic and involved in their work yesterday than they were on their first day here. Two of the medical staff, Dr. Roy Vega, and his wife, Melissa, who specializes in Pediatrics had pictures of one of the little girls that they had seen today. When asked what made this little girl so special they said that she had a cleft palate the severity of which was such that they were going to take her information back to their hospitals to see if they could arrange surgery for her. Dr. Patti Vitale, who specializes in Pediatric Emergency Medicine, is on her second trip with Guyana Watch. She works at Cooper Hospital in Camden, New Jersey. She took a little time to talk about the progamme. Dr. Vitale said that this year the outreaches were much better. She felt that they were more organized and the doctors and volunteers were able to work well as a team. In the last few days, Dr. Vitale would have examined hundreds of children. Dr. Kevin McCabe, who is in his final year of residency at Jamaica Hospital, in Queens, New York, specializes in Family Medicine. He said that examining the children here has been remarkably easy. Where in his hospital the mother and the doctor might have to fight to hold a child still for an examination, here the child will just sit still in its mother’s lap and let him do his job. he has examined have been remarkably healthy outside of the usual skin infections and minor complaints. The doctors noted that a large number of patients have dental issues. The majority of these are children, mostly because of their intake of sugar. The doctors also pointed out that the incidences of chronic diseases tended to decrease the further away they were from the city. After the clinic, the doctors packed up and returned to the hospital, but not for long. 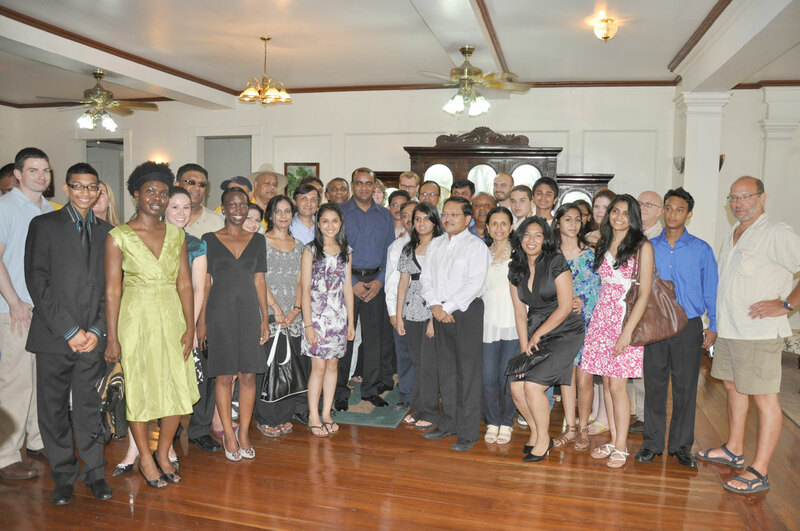 Early yesterday evening the entire Medical team, their support staff and the founders of Guyana Watch Inc dropped in on the President at the State House for a photo opportunity. According to the President of Guyana Watch, Mr. Tony Yassin, the team members intend to spend their last night in the country having some fun before they get back on their plane and head home today. The article claimed that Gilbert Thomas, a 55-year-old man from Matthew’s Ridge, is alleging that he was not accepted at the Hostel because of the assertive stand he took months ago in revealing the advantage that is being taken on the occupants of the Hostel. According to the Ministry, Kaieteur News daringly printed this article without any comments from the Ministry of Amerindian Affairs and without an investigation to ascertain what the issue was. The Ministry stated it does not indulge in victimization and discrimination of any person and more particularly Amerindians. Any Amerindian who approaches the Ministry for assistance is paid due attention, since the Ministry has a mandate to protect and promote the social and economic welfare of Amerindians in a culturally compatible manner. The Hostel is guided by a Hostel Management Plan, according to the Ministry, which outlines the operations of the Institution. A person is refused entry to the in-patient facility based on a history of misconduct and inappropriate behaviour, without efforts to reform or adjust, is then deemed unfit and threatening to other patients at the Institution. The Gibraltar Courtland Fyrish Jessamie African Cultural Group, with headquarters in Courtland Village, Corentyne, Berbice, has released a packed programme for this year’s emancipation celebrations. The programme commenced on July 26, last, and is expected to end with the usual August 1 celebrations at the Fyrish playfield. Emancipation celebration is one of the activities that the villagers look forward to every year. Early in the week, there was a symposium and community dialogue, the honouring of outstanding persons in the area, and a folk night featuring folk songs, dances, dramas and stories, among other activities. Last night there was a Fashion Show and Concert. The Libation and candlelight march is set for tonight. The usual August 1 revelry will kick off at 09:00 hours with a service followed by the unveiling of a monument in recognition of the event. The traditional Emancipation Day festivities will continue throughout the day and will see persons participating in both cultural and stage shows. The usual African foods will be in abundance. The village is known for its traditional African drumming and these drummers will be leading the celebrations.